PRODUCT: 1/4 Inch X 4 Inch Straight Shank Carbide Tipped Drill Bit, Industrial Grade for use with Hammer Drills having 3-jaw Chucks. Powers #0612. Price/Each. DESCRIPTION: The single tip bits are manufactured to conform with ANSI Standard B212.15 and can be used to drill in concrete, block, brick and soft stone. 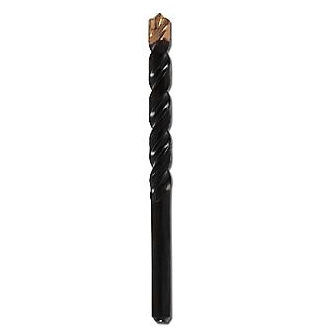 The carbide drill bits are manufactured within a strict tolerance limits for the cutting diameter, the symmetry of the carbide tip to the drill axis, the symmetry of the tip point and the out-of-true variation.